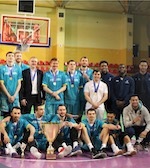 BC Astana conquered the National League title. 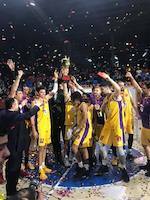 They edged Barsy in Atyrau tonight to claim the sixth League trophy. Anton Ponomarev (210-C/F-88, agency: BeoBasket) scored 22 points to lead the winners. Barsy got to an energetic start. The hosts eked out a 19:18 lead ten minutes into the game. But Astana quickly bounced back. They went on a 25:13 run in the second period to grab a 43:32 halftime lead. Astana extended the lead to as many as 14 points at the final intermission. Astana held Barsy to just 6 points in the fourth period and raced to the victory. Justin Carter (193-G/F-87, college: Creighton, agency: Pensack Sports) delivered 15 points, while Rustam Murzagaliyev (194-G/F-92) had 9 points in the win. John Taylor (185-G-89, college: Fresno Pacific, agency: Promotex) replied with 17 points for Barsy. Da'Quan Cook (205-F-87, college: Z*Orangeville A's) tossed in 14 points in the loss.